Cut the Chicken into Medium size pieces. Mix ginger paste, soya sauce, aginomoto, salt and marinate the chicken for 2 hours. Beat the egg and add to the chicken pieces. Make sure that all the pieces are nicely coated with the egg. The egg will help the flour to stick to the chicken. Put the flour on a plate. Take one piece of chicken at a time and coat the entire piece with the flour. Shake of any excess flour. In a large heavy bottomed pot, add the oil. The oil should be at least 2″ deep. Heat oil. Carefully add the chicken to the hot oil. The temperature will fall a bit, so adjust the heat source as needed. The chicken will take about 12-15 minutes to cook through and should be golden brown on the outside. The chicken should be fried on Medium heat for the first 10 mins and high heat for the next 5 mins. Drain the fried chicken and serve. 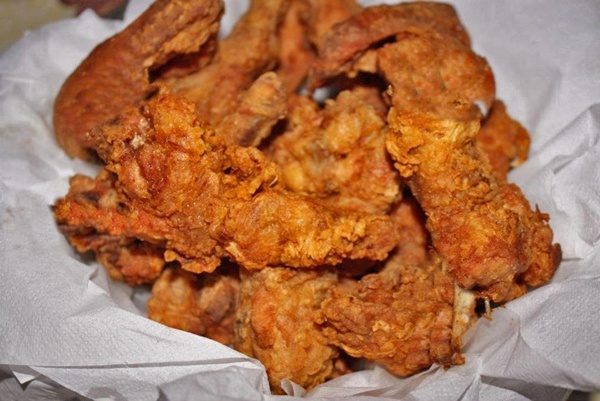 This entry was posted in All Recipes, Chicken and tagged Fried Chicken by Kamakshi. Bookmark the permalink.